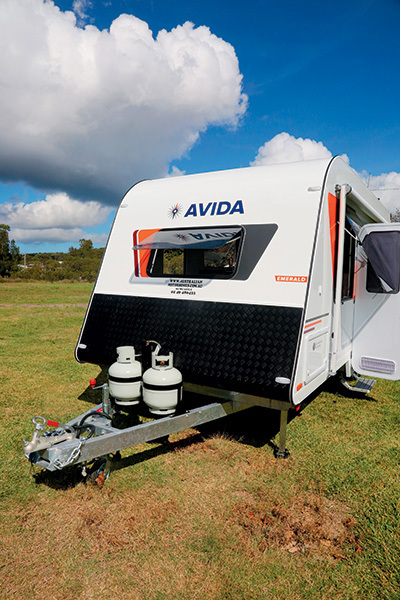 It’s been a few years now since well-known motorhome manufacturer Avida introduced its caravan range into the world. 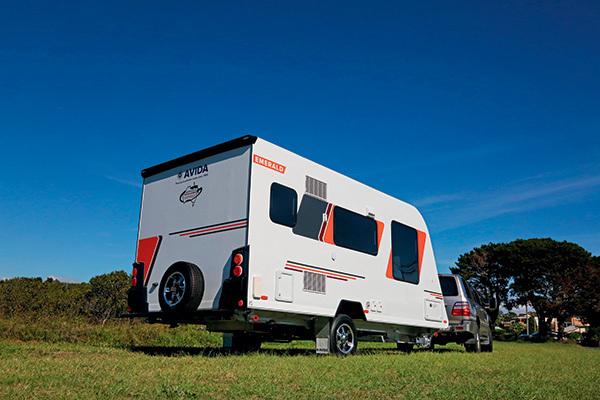 Avida’s vans are a little different from many in the mainstream caravan market as the manufacturer uses a different construction technique with a lighter chassis and a more substantive body structure. This particular van has an ATM of 2200kg, giving it a very decent payload of 466kg and, if the customer so desires, the ATM can be increased, which makes this single-axle van a very interesting prospect. The increased ATM may appeal to some buyers, as filling the two 120L water tanks will take a good bite out of the van’s 466kg weight allowance. 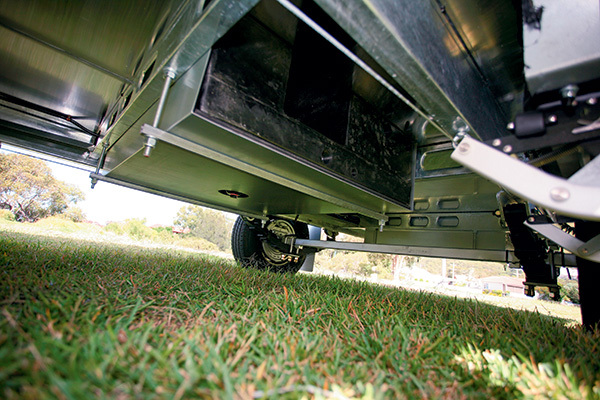 Occasionally, I hear comments from potential buyers who are concerned about the towing characteristics of single-axle caravans compared to tandem-axle rigs, but that is not my experience – as long as the van is properly set up. Indeed, I found the Avida Emerald to be quite a stable van on the road and, because it is relatively lightweight compared to some tandem-axle vans, it was a very pleasant towing experience. 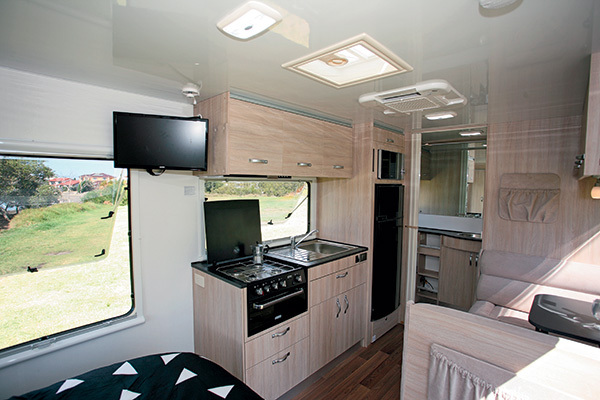 With its set-back front wall and square rear, the Emerald looks quite similar to the rest of Avida’s caravan range, The square rear is offset somewhat by the fibreglass mouldings for the tail-lights and the corners where the roof and wall meets. 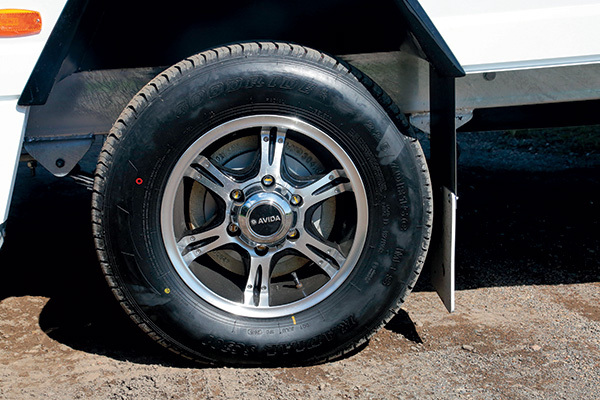 A simple bumper bar across the rear supports the spare wheel. 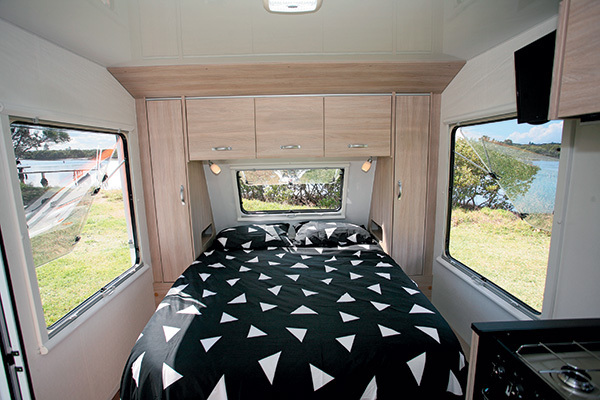 Windows surround the island bed and the mattress measures a standard 1.85x1.52m (6ft 1in x 5ft). There’s a bedhead of side wardrobes and overhead lockers, but no bedside cabinets. Instead, there are small compartments fitted into the wardrobes on either side. 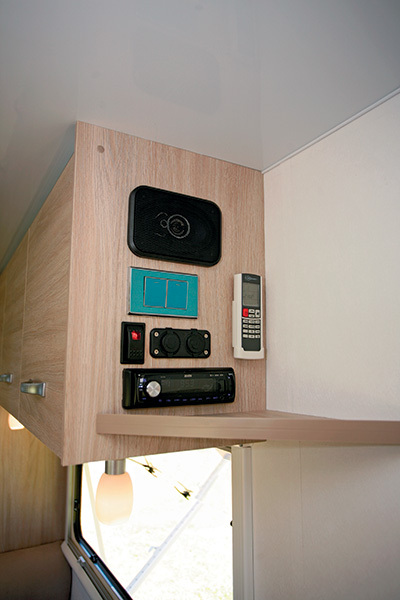 They are not large enough to fit a magazine or a tablet but there is a slot inside the cupboard for that purpose. It’s a bit fiddly, but it’s a neat little compromise. Surprisingly, due to the caravan’s size, getting around the bed isn’t too difficult, even on the side where the kitchen bench is. On that same side, there is a cable tunnel running along the floor against the wall corner but it isn’t really in the way. 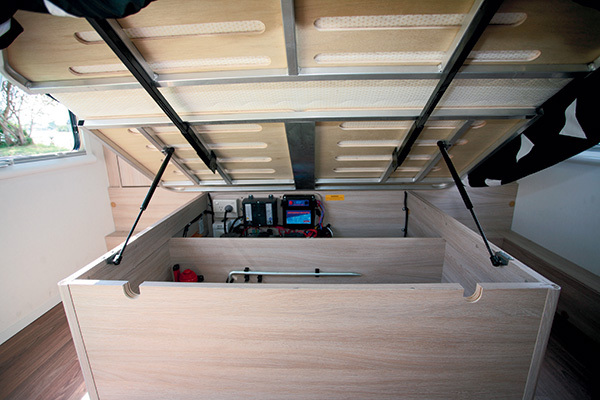 Lifting the bed base gives access to the compartmentalised space under the bed, the front of which is taken up by the battery, charger and breakaway power supply. The mains circuit breaker and 12V fuses are also housed here and are not easy to get at, which would make circuit testing a bit awkward. 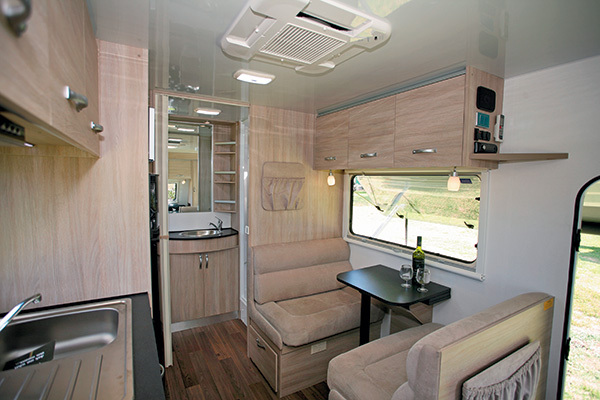 The 23in flatscreen TV is mounted on the end of the kitchen overhead lockers, making for easy viewing from the bed and passable viewing from the dinette. It’s certainly in the most practical position for this van. 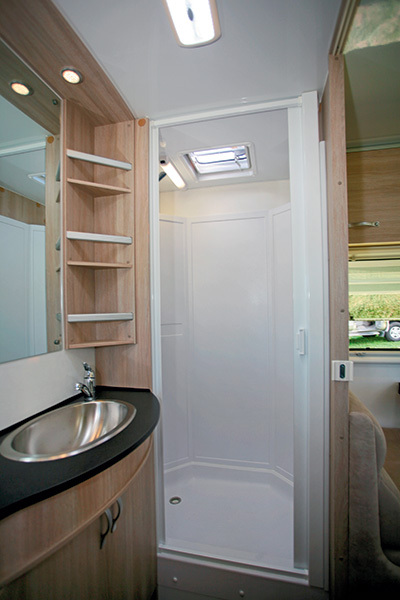 The rear bathroom features a nearside shower cubicle, an offside Thetford cassette toilet and a vanity cabinet in the middle, which has a two-door cabinet below, a decent-sized wall mirror and a set of diagonal shelves in the corner by the shower cubicle. Next to the toilet is what looks like a nice shelf for reading material (which it could well be used for), but it’s actually the removable cover for the Truma water heater. On a practical level, this cover and the shelves above provide a bit of extra elbow room around the loo. There is a locker overhead and a window in between for ventilation. There are a number of powerpoints located at the end of the kitchen bench, under the rear dinette seat, under the nearside of the bed and under the bathroom wash basin but, except for the latter, they are all single outlets. In this day and age of multiple appliances, I thought that seemed a bit too economical. There are a couple of 12V/5V USB outlets above the shelf on the dinette side of the entry door, which is great, but the space really isn’t large enough for an iPad. 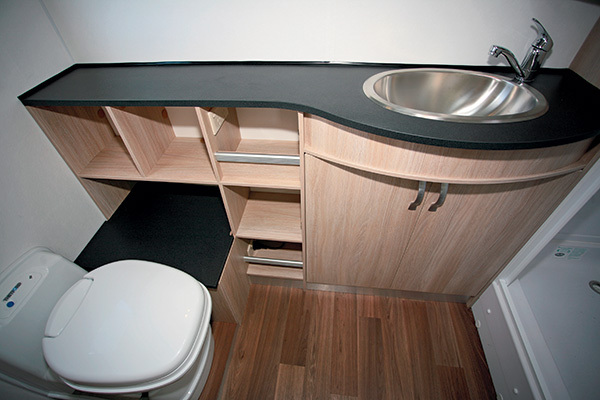 What I like about this 5.47m (17ft 11in) Avida Emerald is that it demonstrates how you can downsize, giving you the benefit of the weight reduction, without losing any of today’s caravanning essentials. That includes retaining the front bedroom and rear bathroom that’s de rigueur at the present time.